Clergy and lay delegates representing parishes from across the Orthodox Church in America’s Archdiocese of Canada nominated His Grace, Bishop Irénée to fill the vacant See of Ottawa and Canada at an extraordinary Archdiocesan Assembly here on Thursday, October 2, 2014. Bishop Irénée‘s name will be forwarded to the Holy Synod of Bishops for canonical election. His Beatitude, Metropolitan Tikhon, chaired the Assembly, which opened with the celebration of the Divine Liturgy. The electoral plenary session followed. 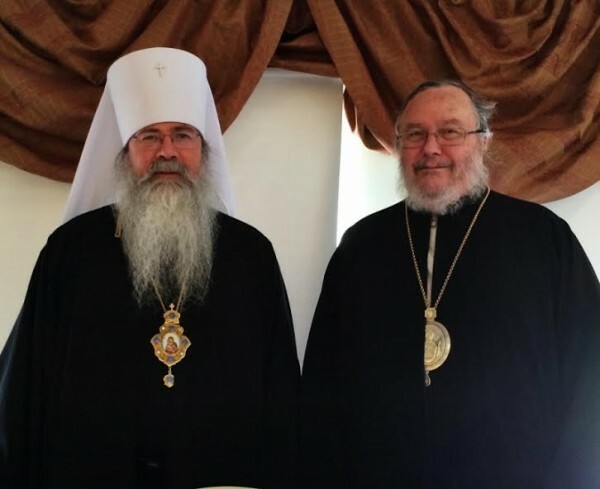 Earlier, members of the Archdiocesan Council had been appointed by Metropolitan Tikhon to act as a search committee to identify possible candidates. Bishop Irénée was born in Montréal, Quebec on December 25, 1948. In 1971, he received a BA in Slavic Studies from the University of Ottawa, after which he began studies at Holy Trinity Seminary, Jordanville, NY. He was accepted as a novice at Holy Trinity Monastery and placed under the spiritual guidance of Archimandrite Kiprian. In 1974, he was tonsured a Rassophore monk. The following year, he was tonsured a Stavrophore monk with the name Irénée, in honor of the sainted hieromartyr of Lyons. In 1978, he was blessed to serve in France. In May of the same year, he was ordained to the diaconate in Brussels, Belgium, and in August to the priesthood in Geneva, Switzerland. He continued to serve in France until 1982, at which time he returned to Canada to serve Montréal’s French mission. He and the mission’s faithful were received into the OCA in 1986. In 1992, Hieromonk Irénée was elevated to the dignity of Igumen by His Grace, Bishop Seraphim of Ottawa, to care for the French language monastics in Québec. He also served as a supply priest to the parishes in Montréal, Ottawa, Toronto and Québec City. In April 2009, the Holy Synod of the OCA elevated Igumen Irénée to the dignity of Archimandrite and elected him as an Auxiliary Bishop in the Archdiocese of Canada with the title of Bishop of Québec City. In October 2009, ten bishops participated in his consecration to the episcopacy at Ottawa’s Annunciation Cathedral. On October 1, 2010, the Holy Synod appointed Bishop Irénée as Administrator of the Archdiocese of Canada.